If you own or operate a boat, lawn mower, or anything else that has wheels you may have to replace the push-pull cables at some point. A lawnmower’s throttle uses this type of cable to adjust the flow of gas to the carburettor. Vehicles use this type of cable to operate the brakes and clutch. Boats use this type of cable to connect the steering wheel to the motor. Since push-pull cables have so many different types of fittings on their ends, it is very important that you measure them correctly to ensure the right length. 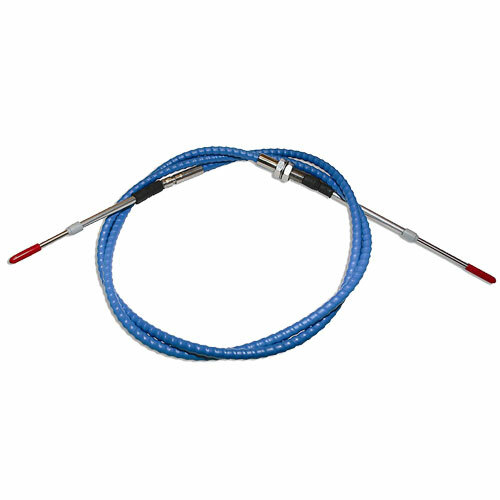 Here are some quick tips on how to correctly measure a push-pull cable. First, make sure you measure the cable without any of its end fittings from tip to tip. Then measure the cable with its terminal fittings from tip to tip. Terminal fittings can be either stop on the ends, cylinder-like studs, or round balls. Next lay out the cable on a flat, sturdy surface. Use a measuring tape but make sure you put the tip of the tape inside either a loop or hook fitting on the left side of the cable. Stretch the measuring tape all the way down to the right side of the cable inside the same loop or hook. Next, you have to measure a fork fitting on the end of the cable making sure you run it along the straight part of the fork. After you have done this, divide the measurement by 2, marking it with either a grease pencil or chalk. Do the same thing for the other side of the fork end. When this is complete put the end of the measuring tape on the centre mark on one of the forks and measure all the way to the centre mark on the other fork. Your next step is to put the end of the measuring tape on the centre of the hole in a pin centre fitting. Then measure all the way to the centre of the hole on the other end of a pin centre fitting. This type of fitting is made of a solid metal. It will have a hole in the middle of it near the end so that it can slide over a pin for the installation. There you have it. If you are ever in need of replacing a push-pull cable you’ll know how to measure it properly before you install it. If you need more detailed steps to do this there are many references available online for you to utilize. But, it does feel good to be a do-it-yourselfer, doesn’t it?